To smooth the frown lines between the eyebrows by weakening the Procerus, Corrugator Supercilii and Depressor Supercilii muscles. To smooth the forehead lines by weakening the Frontalis muscle. To smooth the so called “crows feet” or laughing lines next to the eye by weakening the lateral part of the Orbicularis Oculi muscle. The elevate the outside corner of the eyebrow by weakening the supero-lateral part of the Orbicularis Oculi muscle. To turn the corners of the mouth up in people with permanently downturned mouth corners by weakening the Depressor Anguli Oris muscle. To soften the so-called Marionette lines. These are deeper furrows that run from the corner of the mouth down to the jaw line. To soften the appearance of a dimpled chin. Some people are very prone to excessive dimpling (orange peel look) of the chin. The muscle injected is called the Mentalis muscle. To soften the skin creases on the bridge of the nose, the so-called “bunny lines”. These lines are very prominent in some people and absent in others. The muscle involved is the Transverse Nasalis muscle. To soften so-called “smokers lines” on the upper lip by weakening the Orbicularis Oris muscle. To decrease upper lip retraction in people with so-called “gummy smiles”, by weakening the Levator Labii Superioris Alaeque Nasi muscle. To shrink excessively large jaw clenching muscles that sit over the corner of the jaw. The condition is called Bruxism and the muscle involved is the Masseter muscle. People that grind there teeth are prone to this. It can give the face a pyramid shape (broad base and narrow top), rather than the normal inverted pyramid shape (narrow base and broad top). To weaken jumping / twitching muscles, like a jumping / twitching chin (Mentalis) muscle. To treat excessive sweating of the underarms. Botox is a trade name for a chemical produced by the company Allergan. Botox contains Botulinum toxin type A, which is a chemically synthesized. It was originally identified in a bacterium called Clostridium Botulinum. How does Botox improve wrinkles? Botox causes localised skeletal muscle paralysis by blocking the effect of motor nerves on skeletal muscles. Botox was first used medically in 1980. The cosmetic effect of Botox was initially described by ophthalmologist Jean Carruthers and dermatologist Alastair Carruthers, a husband-and-wife team working in Vancouver, Canada. The results were published in the Journal of Dermatologic Surgery and Oncology and the first paper was given in 1991 by Dr. Jean Carruthers at the American Society for Dermatologic Surgery meeting in Florida. Botox has been used safely and successfully in ophthalmology for over 20 years and for over 16 years in dermatology. No long term side effects have been attributed to the use of Botox. Short term side effects are minimal. Temporary bruising localized at the area of injection can occur. This can be covered with make-up. Headaches sometimes occur that can be relieved with Paracetamol. When injecting around the eyes, upper eyelid drooping is a risk, but also very uncommon. The effect on the eyelid resolves in days to weeks, but can be quickly improved with Iopidine eyedrops. Will Botox injections give me a stiff, frozen look? No, not if the correct dosages are used and the correct muscles are injected. Can I have Botox injections if I am pregnant or planning to become pregnant? No. There is no evidence that Botox can harm the foetus, but as a general rule it is better to avoid all foreign chemicals during pregnancy. The cost per unit is R76 (2017 price). For the brow area 20-28 units are used depending on muscle mass. For the “crows feet” area 14-18 units are used depending on muscle mass. Fewer units can be used, which will make the treatment less expensive, but the effect will not last as long. 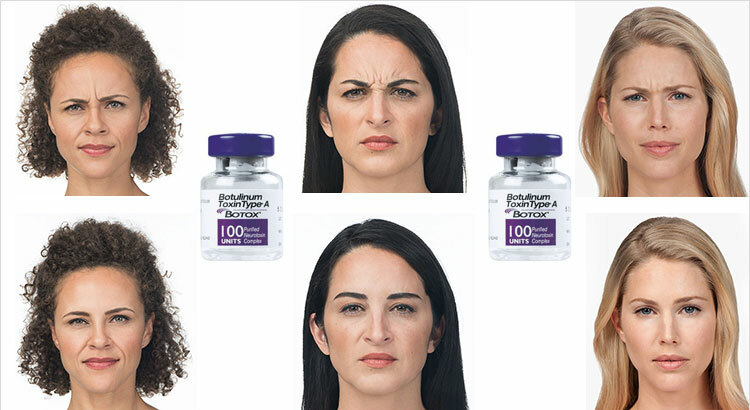 How long will the Botox effect last? Botox will last between 3 and 6 months, depending on the dose used and the speed with which your body breaks down Botox. Will botox help for my bells syndrome. My one eye much smaller and also the side of mouth a little damaged. Botox is not a treatment option. Hello, I do not have crows feet but i do have wrinkles under the eye, can botox be used in this area? Dermapen with Platelet Rich Plasma is a treatment option.